En Bloc Fever - Is It Over-Heating The Market? Preliminary numbers for Q1 2018 showed that developers launched around 1,100 units for sale, both from projects already in the market as well as new projects such as Nim Collection, 8 Hullet and The Tapestry. Positive market sentiments helped to secure a take-up rate of 1,550 – 1,600 units. The recent active land market has aroused much attention among industry players, policy makers as well as the man on the street. Questions concerning potential oversupply, the ability of the market to absorb the units and whether prices would rise so fast as to edge out home buyers have resurfaced. The real test comes in Q2 2018 to 2019: will the market be overheated when this supply come on stream? Will the en bloc fever overheat the market? This paper lays out the likely time-line for the launch of the new projects from Q2 2018 to Q4 2019 and analyses the historical patterns of supply and demand to throw some light on how the market is likely to behave. From mid-2016 to 23 April 2018, 86 sites have been sold collectively or through the Government Land Sale (GLS) programme. These 86 sites will translate into new launches that can be offered to homebuyers from the second quarter of 2018 to the end of 2019. As a guide, we have allowed nine to 12 months for projects to be built on GLS sites to obtain all planning approvals before they can be launched. 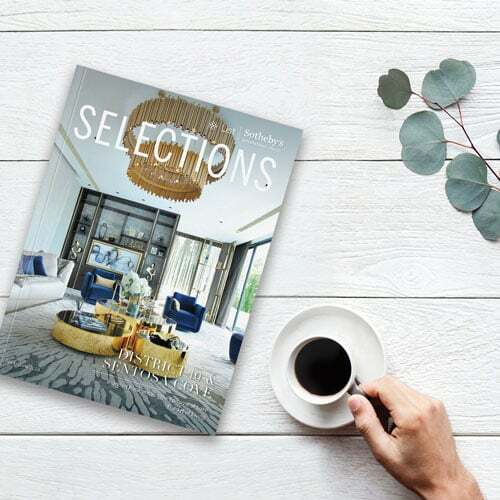 For projects from en bloc and collective sales, we presume a longer period of 15 to 18 months will be required as some of the en bloc sales will need the extra step of obtaining approval from the Strata Titles Board. For the period Q2–Q4 2018, up to 29 new projects supplying some 14,200 units can be launched. These sites were acquired by developers between mid-2016 and August 2017. Six of these sites are located in the Core Central Region (CCR), 13 in the Rest of Central Region (RCR) and 10 in Outside Central Region (OCR) (Map 1). The 13 sites in RCR are expected to provide 7,327 units (52%) and include Margaret Ville and projects to be built at Eunosville, Raintree Garden and Shunfu Ville. Major projects supplying the 6,460 units (45%) in OCR include Twin View and projects at Rio Casa, Serangoon Ville and Tampines Court. The CCR is expected to see a modest new supply of 403 units (3%) through projects like 3 Cuscaden, 120 Grange, and those located at 1 Draycott Park, former Sloane Court Hotel and River Valley Road. For 2019, 57 new projects supplying around 15,100 units can be expected from the sites sold between September 2017 and mid-April 2018. 26 of these are located in CCR, 17 in RCR and 14 in OCR (see Map 2). The RCR is still expected to yield the largest supply of 6,235 units (41%). The more prominent projects are located at the sites of Asia Gardens, Goodluck Garden, Jiak Kim Street, Katong Park Towers, Mayfair Gardens, Parkway Mansion and Vista Park. 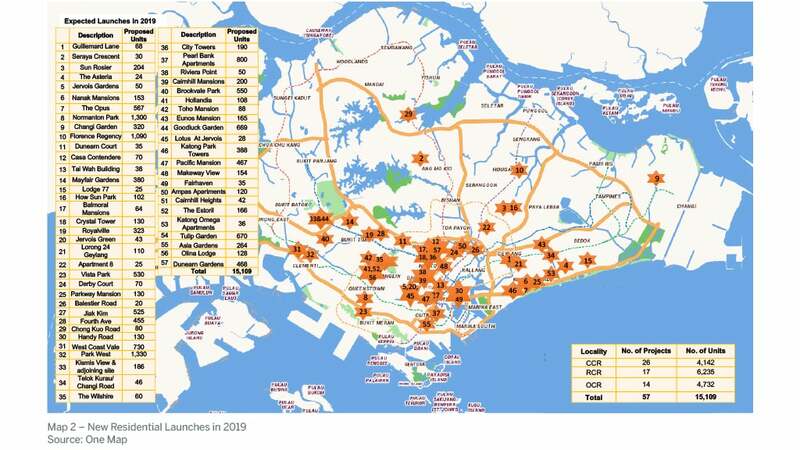 In OCR, the main projects contributing to the bulk of the 4,327 units (31%) include Brookvale Park, Changi Garden, Eunos Mansion, Florence Regency and How Sun Park. The potential supply in CCR rises significantly to 4,142 units (28%), derived from projects to be built on the sites of Casa Contendere, Crystal Tower, Dunearn Gardens, Pacific Mansion, Royalville, The Estoril and Tulip Garden as well as two GLS sites at Fourth Avenue and Handy Road. Looking back at the three years of recovery in 2009 – 2011 following the sub-prime crisis in 2008, developers launched an average of 15,400 units per year. At that time, URA statistics showed that the unsold inventory under construction (launched and unsold, unlaunched projects with planning approvals) held by developers was around 35,000 units. Further on, during the three years of market downturn in 2014 – 2016 following the introduction of a series of cooling measures which included the 15% Additional Buyer’s Stamp Duty (ABSD) and 60% financing cap via Total Debt Servicing Ratio (TDSR) framework, developers launched an average of 7,500 units per year. By then, the unsold inventory held by developers was reduced to around 24,000 units through gradual absorption by the market. When demand picked up in 2017, the unsold inventory was further reduced to 18,900 units by end-2017. Based on historical precedence, for developers to launch around 15,000 units (Table 1) would not seem too ambitious for three reasons. Firstly, the market is now on recovery tract, similar to the period of 2009 – 2011. Secondly, developers had sold most of the units in existing projects and reduced the unsold inventory to a manageable number. Thirdly, developers will also likely pace their launches depending on their business strategies. The mandatory five-year project completion period and extension charges that will be levied on foreign developers should they not sell out all units within two years after their projects (built on non-GLS sites) will ensure that developers manage their supply and sales rate to avoid paying ABSD and extension charges. In addition to historical trend, the current market also indicates that the projected supply of around 15,000 units in 2018 and 2019 is not excessive. There are signs that the current en bloc frenzy will slow down in the near future. Most of the developers have already built up a substantial land bank in the past two years. Furthermore, land prices have risen significantly since early 2017 and more developers are becoming increasingly selective in collective sales. They may choose to acquire GLS sites instead which have lesser uncertainties. As the rate of acquiring sites slows down, it will allow time for developers to recalibrate the estimated supply by phasing the launches. 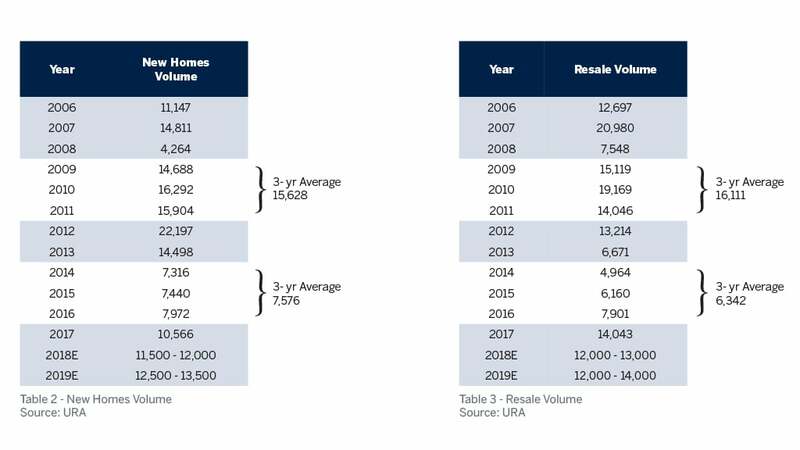 Looking at the demand side of the equation, during the three years of recovery in 2009 – 2011, the average annual volume of new homes sold and resales were 15,628 and 16,111 respectively. This was despite a series of measures introduced by the government to steer the market in the direction it wanted and to prevent prices from escalating. Demand was basically driven by a confluence of factors such as the ultra-low interest rates, high liquidity and the influx of foreign investors. It was only when the government introduced the TDSR framework in June 2013 that both sales volume and prices began to fall. During the three years of market downturn in 2014 – 2016, the residential price index declined by 10.4% and average sales volume declined to 7,576 new homes and 6,342 resales. This represents fundamental demand at the lowest point of the market. In March 2017, the government made a surprise announcement about “calibrated adjustments” to the seller’s stamp duty (SSD) and TDSR framework. Coupled with an improved outlook on global economy, home sales volume picked up robustly and prices bottomed out by Q2 2017. 2017 saw a spike of 33% in new home sales and a 78% surge in resale volume, compared to 2016. This could be attributed to positive sentiments arising from the stronger economic performance as well as pent-up demand after three years of down-market conditions. 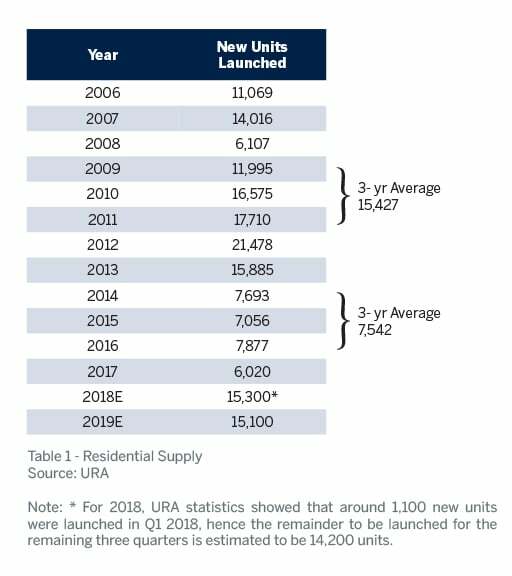 URA’s preliminary numbers of 1,550 – 1,600 new homes sold and 3,400 resales in Q1 2018 coupled with a 3.1% rise in the price index show that market sentiments have remained strong. In light of Q1 2018’s performance, we project an increase of 10%-15% p.a in demand over 2017’s level. This will translate to an expected demand of 11,500 – 12,000 new home sales in 2018 and 12,000 – 13,500 in 2019, which are still below the historical average of 15,628 units (Tables 2 and 3). Even with the current positive market conditions and confidence, we expect market demand to be below the average demand between 2009 and 2011, and lower than the market peak level in 2007. Location, price points and level of competition among the projects will determine the absorption rate of these units when they hit the market. For resale homes, we can expect similar volume as 2017’s level, or perhaps a marginal drop in demand as new launches will share the limelight from the improved sentiments. Demand will continue to be driven by liquidity and low interest rates. With the cooling measures still in place, end-users who form the underlying demand and investors holding a longer-term view of the market will make up the total demand. In land scarce Singapore, owners and investors have come to rely on real estate being a reliable source of capital preservation, legacy planning and appreciation. In addition, fresh demand can be expected from a portion of the sellers of the recent bout of collective sales. Land prices have been re-rated swiftly through the slew of land sales from October 2016 to April 2018. Consider for example, three areas with a high concentration of land sales: Serangoon/Upper Serangoon Roads (Chart 1), Bukit Timah/Holland Roads (Chart 2) and Orchard/River Valley (Chart 3). 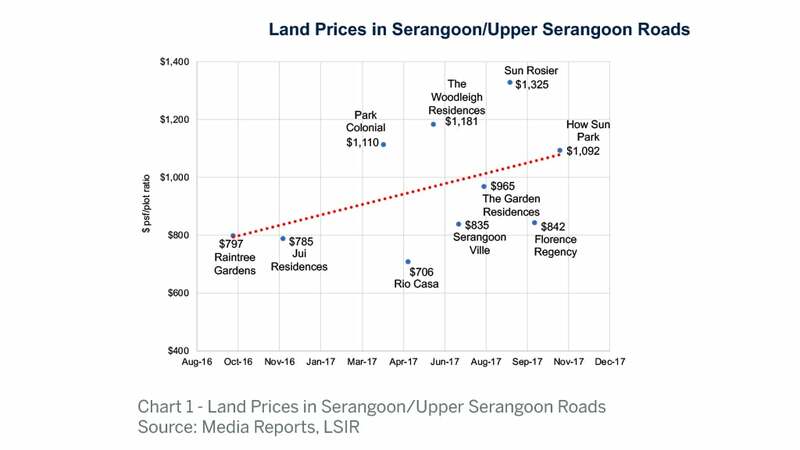 Putting aside tenure, based on the 10 sites located along Serangoon/Upper Serangoon Roads that were sold over a span of 15 months, the trendline shows that land prices have risen by around 35%. 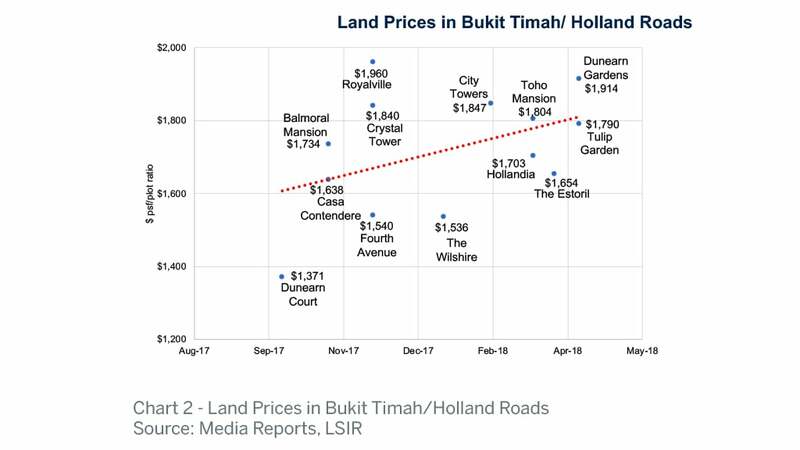 For Bukit Timah/Holland Roads, the trendline for the 12 sites sold rose by around 13% over a shorter period of seven months. 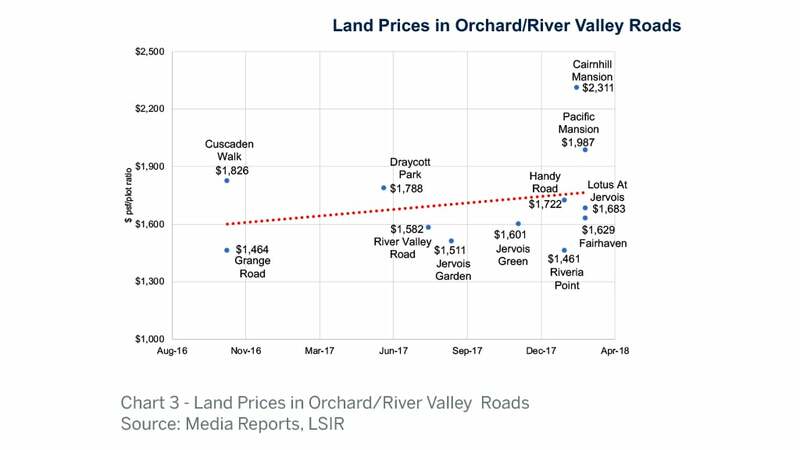 The trendline for the 12 sites sold in Orchard/River Valley Roads showed a 9% increase in land prices over a period of 18 months. Developers’ hunger to replenish their land bank and the entry of foreign developers have resulted in aggressive bidding thus driving up land prices at a rapid pace, some to record-breaking levels. Given the higher land prices, we can expect new norms to be set in prices. 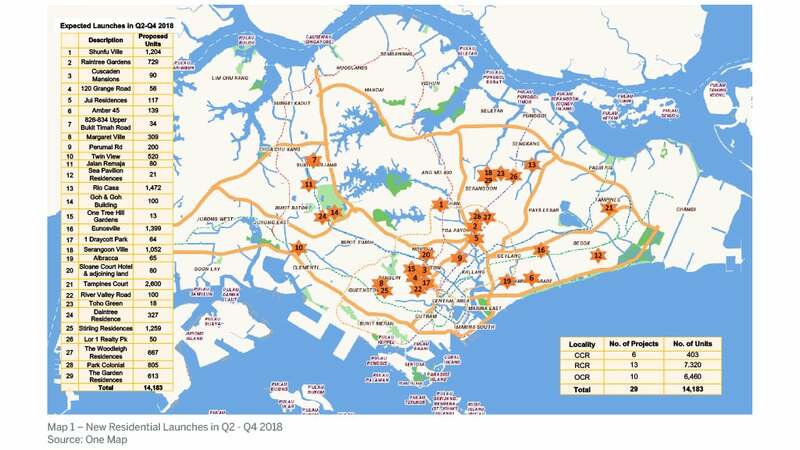 Already, the new launches in Q1 2018 showed that prices of leasehold projects in OCR have moved up to $1,400 psf from $1,200 psf in 2017. Freehold projects and mass market projects that are located in RCR are now priced at $1,800 psf, up from $1,500 to $1,600 psf previously. Within the CCR, new launches in Holland Road and Bukit Timah are now calling $2,300 to $2,500 psf while those in Orchard area are selling at above $3,000 psf. Should prices rise faster than expected, there is a wild card – government’s intervention. As it has always been the government’s stance to ensure a stable and sustainable property market, it will monitor the market closely and will likely take appropriate actions where necessary. Will the residential market be over-heated in 2018 and 2019? Our house view is it is probably not yet. Home buyers of today are more discerning and will exercise financial prudence. They will be prepared to hold the property for at least three years to avoid paying the Seller’s Stamp Duty. Developers will have to manage their costs and keep home prices within the affordable limits of home buyers. Therefore, they will have to pace their launches and adopt the strategies of right-sizing and right-pricing to ensure healthy sales volume while remaining profitable. Anecdotal data have shown that foreigners are showing their confidence in the Singapore residential market again. The number of foreigners investing into Singapore have increased substantially year-on-year despite the cooling measures. This return of confidence will no doubt confirm that Singapore real estate, relative to other major cities, is still a choice destination yielding long term sustainable appreciation. The coming launches of luxury projects like 3 Orchard-By-The-Park, South Beach and Swire Group’s project at Draycott Park will likely welcome the return of foreign investors as these projects have the attributes that attract regional interests.